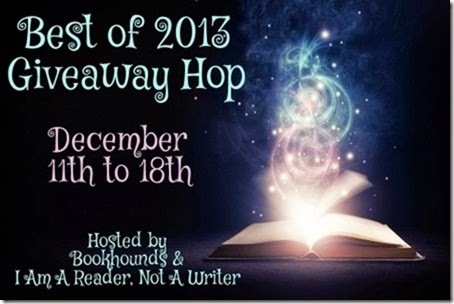 A big thank-you to Mary at Bookhounds and I Am A Reader, Not A Writer for hosting this great hop. On my stop, I'm giving away your favorite book of 2013. I read so many amazing books this year: books from different genres, a lot of new releases -- and I discovered some great older reads as well. If I included all my favorites, this post would be out of control; so in the spirit of the Twelve Days of Christmas, I've narrowed it down to twelve favorites that released this year. Choose from my list above, or you can pick your favorite 2013 read ($15 limit). This giveaway is International. US winner will receive their book from Amazon. International winner will receive their book from The Book Depository.